Materials & Methods worked for Partners Healthcare Network to lead the design and development of integrated digital signage systems for the new $350 million Spaulding Rehabilitation Hospital in Charlestown, MA. Working in collaboration with Gamble Design Studios and Perkins + Will architects, our team explored creative means of merging static and digital signs and interpretive art installations throughout the hospital. 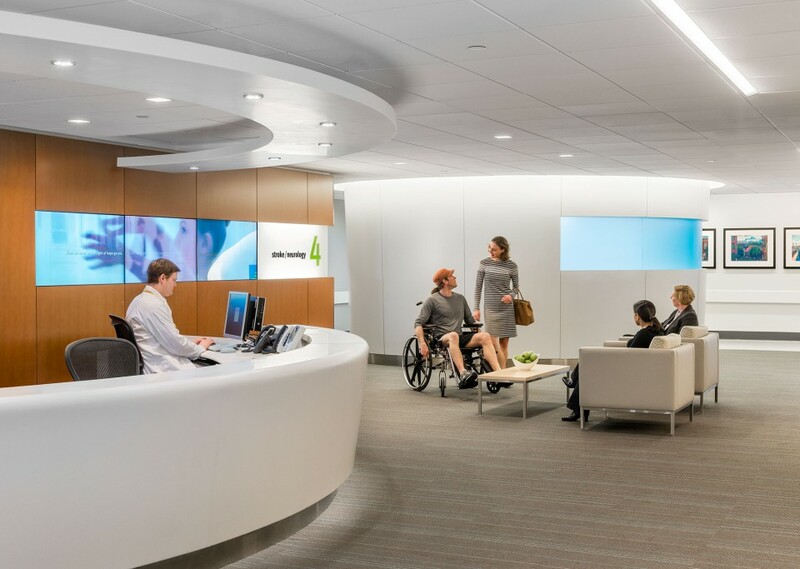 A wide variety of content scenarios were produced to be compelling to visitors and reinforce the Spaulding brand, while not being visually distracting to patients and staff who would see the installations on a daily basis. Materials & Methods continues to work with Partners Healthcare Network and Spaulding Rehabilitation Center to explore opportunities to enhance patients’ experience through technology. Rows of architecturally integrated LCD displays on each floor serve to direct patients, while also providing an engaging storytelling platform to feature the hospital’s history, inspiring patient stories, and patient artwork. Custom media content was created for seamless playback over horizontal arrays of multiple, low-bezel, LCD displays.